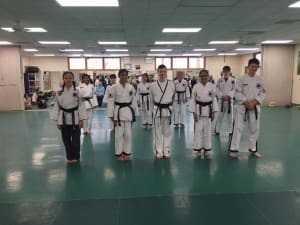 Congratulations to one of our black belt test groups! They worked hard and were well prepared. Testing for black belt is an excellent example of goal setting. Students set their goal of their next black belt rank. They set a plan to achieve this goal which involves coming to class regularly and practicing at home. They receive guidance and motivation from their instructors along the way. Finally, they feel a great sense of accomplishment after the test is done with the reward of new techniques and challenges. What a great life lesson for their future education, career and family! Check out of trial membership to get you started on this wonderful journey!